Redken's #1 best selling root volumizing spray, Guts 10 Volume Spray, is suitable for all hair types, including coarse, fine, color treated and natural hair. Give your hair root lift like no other while providing a natural feel and texture. This anti-frizz volumizing hair spray adds flexibility, fullness and thickness to hair. Manage fly-always and frizz with Redken's lightweight but powerful Control Addict 28 Extra High-Hold Hairspray. The anti-frizz solution for sleek, controlled hair. This ultra-high hold hairspray dries quickly with no flaking or residue for a flawless, long-lasting finish. Suitable for color treated, natural, straight, wavy and curly hair. Redken Style Stay High 18 High Hold Gel to Mousse is a volumizing strong hold hair gel mousse that provides a long lasting hold and fullness to the hair. We are very serious against false claims. Any attempts with intend to manipulate our system will result in appropriate repercussions. Curvaceous Ringlet is a daily use, premium product from Redken that contains an exclusive Bonding system designed to shape, shine and revitalize your luxurious curls. REDKEN BREWS CLAY POMADE. Rub a small amount of Redken Brews Clay Pomade in hands and work through damp or dry hair to style. 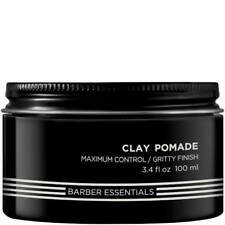 Clay Pomade is suitable for all hair types, but works especially well in fine hair that needs help holding a hairstyle. Highest hold hairspray with no crunch. Triple Take 32. 9 oz / 255 g.
Long lasting texturizing hair paste creates rough and ragged texture with non-stop separation and sculpts strong styles with moldable hold. ROUGH PASTE 12. Rub a small amount in hands and apply on damp or dry hair. Redken Water Wax 03 Shine Defining Pomade 1.7 oz🤩NEW🤩Free Shipping!!!! Condition is New. You Will Receive a New 1.7 oz. Redken Water Wax 03 Shine Defining Pomade. No exceptions. We are very serious against false claims. Any attempts with intend to manipulate our system will result in appropriate repercussions. (excludes samples). 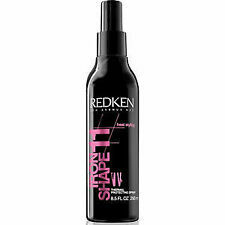 Redken Style Iron Shape 11 Thermal Holding Spray is a lightweight thermal spray that protects hair from usage of flat irons and curling irons while reducing frizz and enhancing shine. We are very serious against false claims. 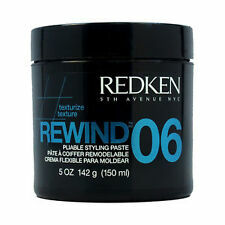 Redken rough molding paste. Deconstruct that cut with rough-ragged texture and moveable non-stop separation. For rough-ragged texture. Redken High Rise Volume Duo Volumizer provides lift and body for all hair types. A dual volumizer, High Rise combines a lightweight volumizing cream with a high life hair gel for voluminous, full style. For flawless root lift and body, this volumizer leaves hair polished and silky. Contains filloxane that works on every hair strand to create a visually fuller effect. Achieve perfect beach waves with this texturizing wax aerosol hair spray. Mist on damp or dry hair. Shake well. Wax Blast 10. High Impact Finishing Spray-Wax. Travel Size . Velvet Gelatine 07 Blow Dry Gel 3.4 oz by REDKEN. Redken - velvet gelatin 07 - cushioning blow-dry gel Reinvent blow-dries with body and bounce. This is a real authentic hair salon Redken Product. This item is new, Sold by a HAIR SALON, unused, full, and the. REDKEN FRIZZ DISMISS. Frizz Dismiss features the exclusive Humidity-Resist Complex Frizz Protection Factor (FPF). 1 OZ / TRAVEL SIZE / TSA APPROVED. The first ever professional scale, allows you to choose the protection you need based on hair type and humidity level. REDKEN HARDWEAR 16. SUPER STRONG SCULPTING. won't flake. How to use: For a perfect lacquer finish, apply to damp hair and air-dry. Use to slick back longer hair—it dries to a long-lasting wet-looking finish. Thermal Holding Spray. This lightweight, thermal heat protection hair spray is perfect for. Spray on wet or dry hair before using a styling iron. Lightweight thermal spray protects hair from heat up to 450ºF/232°C. In the event that the item you receive is not as described we will be happy to work with you and make sure that you are satisfied with your experience. 5 oz (150 ml) - 1 jar. Our pictures show actual item you're purchasing! 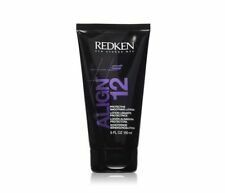 Redken Align 12 Ultra-Straight Balm contains a heat-style protective balm with fortifying sugars to help build strength while straightening. Through the exclusive Bonding System and a new anti-frizz technology in Redken's Align 12 Ultra-Straight Balm, conditioning agents are locked in, while humidity is locked out. It improves manageability, reduces dryness and adds smoothness to hairs. Looking for the quick, effective, anti-frizz solution for protecting and styling your hair? Look no further than Pillow Proof Blow Dry Treatment Primer Cream. This multi-purpose hair primer leave-in cream helps reduce drying time while leaving hair feeling nourished and prepping it for a smooth looking blow-dry with a salon-like finish. The Redken Iron Shape 11 Finishing Spray is formulated to protect your hair from curlers and hair straighteners that can heat up to 450 degrees. Its lightweight and clean formula ensures your hair is not sticky and stiff. Silicone smoothes and brings out extra shine. Create an effortless style with texture and hold. Firm yet moldable to work easily through hair. Warning: This product may contain chemicals known to the state of California to cause cancer, birth defects or other reproductive harm. Redken Guts 10 Volume Spray Foam 2oz Travel Size - NEW & FRESH - Fast Free Ship! 3.5 out of 5 stars - Redken Guts 10 Volume Spray Foam 2oz Travel Size - NEW & FRESH - Fast Free Ship! 3 product ratings3 product ratings - Redken Guts 10 Volume Spray Foam 2oz Travel Size - NEW & FRESH - Fast Free Ship! Fatten up fine hair. Lightweight styling lotion adds substance and shine. Get thick, beautiful hair by using this hair lotion. The easy-to-apply hair finishing cream gives the styling power to sculpt a look, while taming rebellious frizz. Silicone and carbohydrate lock styles in place with a touchable, flexible hold. The hair finishing cream can be worked into wet or dry hair for effortless use. For long-lasting and firm hold, use Redken Quick Dry #18 Hair Spray. While the formula is strong enough to set your style, it is brushable and does not leave your hair feeling stiff or sticky. We are very serious against false claims. Great for pompadours and smooth, flexible styles. 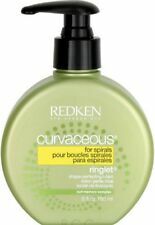 "Redken Curvaceous Ringlet Protection Lotion for Unisex, 6 Ounce"